In love with these photos! Everything is perfect:) The bag, the slides and the jacket! amazing jacket! i want it! Wauww amazing look and love the slides! Fan de ces couleurs, de ce look, de cette veste... !! Ca change des autres vestes en cuir, celle-ci fait plus sophistiquée ! Such a gorgeous jacket, and I love it paired with pool sliders! Cette veste est génialement parfaite ! La coupe, la matière : j'adore ! Je sens l'odeur du - vrai - bon - beau - cuir je chez mooooooooooi !!!!! That jacket is amazing! Love it so much. Wowwwww this jacket!! In love! Ahhh I love it! 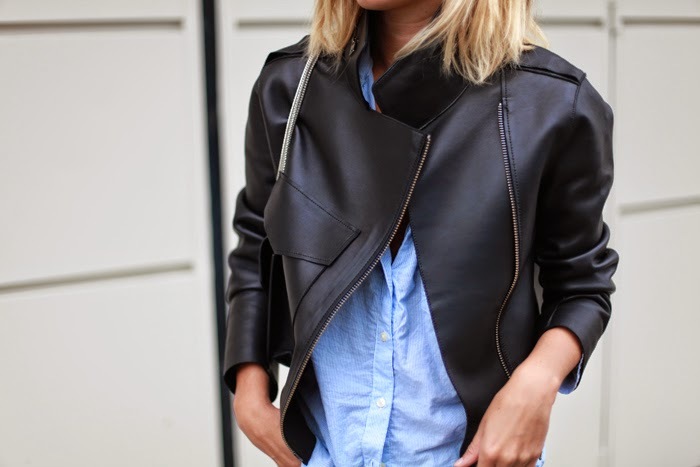 The perfect leather jacket!! Très jolie veste, le cuir semble d'excellente qualité.